In 1994, Tim Berners-Lee founded the World Wide Web Consortium (W3C) in order to make all software and hardware web accessible. The W3C is international vendor-neutral group dedicated to bringing standards to the web. The conformity to uniform methods of coding HTML, XHTML, and HTML5: HTML has new rules to follow that would improve the presentation of pages across a wider array of devices. XHTML, an enhanced version of HTML 4.01, follows stricter coding rules to improve the accessibility of pages across browsers, operating systems, and other devices that access the Internet. HTML5 is the latest version of HTML (and is the current standard, unless you have a good reason to write XHTML code instead) and further aims to improve how content gets delivered on the Internet. With it come many new features including new coding rules for improved parsing, new elements and input attributes, better support for audio and video, the addition of dynamic features like geolocation, and the deprecation of some less-effective tags and attributes. The inclusion of DOCTYPEs in web code: By adding a DOCTYPE tag to the code of all HTML, XHTML, and HTML5 pages, the browser can interpret a web page as an application in the XML programming language. As a standard, this is important because XML allows programmers to create proprietary markup languages through which even more information can be exchanged on the web. 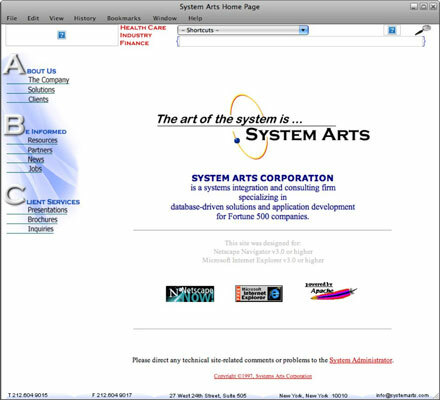 Here is an example of an early, unorganized website from 1998, which was built with frames (which aren’t used anymore) and offered three different navigation options for visitors, including a jump menu, graphic buttons, and hypertext links. Now that standards exist, the web is a much more organized, efficient place to shop, research, mingle, and interact.